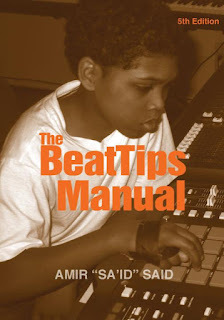 The BeatTips Manual has long been regarded as the beatmaking Bible by many in the hip hop and beatmaking community. Now available as a digital download, The BeatTips Manual looks set to further solidify its position as the go-to book on beatmaking, as an instructional resource and cultural document. In this exclusive interview The New Beat Maker speaks to The BeatTips Manual author, accomplished beatmaker, MC and beattips.com founder Amir 'Sa'id' Said about the book's conception, influences and value to both new and experienced producers. TNB: The BeatTips Manual is over 400 pages and is comprehensive in its exploration of beatmaking. This must have been a massive undertaking. Can you tell me a bit about the book’s conception and how you went about writing it? Sa'id: Writing The BeatTips Manual was certainly a massive undertaking; it’s a big book, content wise and size wise! I wrote the very first edition back in 2001, and since then I’ve been writing, making music, developing my skills, researching, interviewing key beatmakers (producers) and other people in music, and just working my way towards the 5th Edition, the ultimate edition, as I envisioned it ten years ago. I originally just wanted to create a beatmaking—music making—manual for my son, who was five years old at the time. 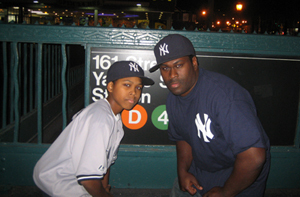 I actually began as a rapper and I wanted my son to know the hip hop/rap music tradition. I wanted him to have this personal guidance that would not only teach him how to make beats, but also teach him music history and how to appreciate music. The manuscript that I created for my son was an organized collection of a lot of legal-size yellow notebooks. After going over these notes with him, we both decided that it would be a great book. So much of the very first edition of The BeatTips Manual came from those yellow notepads. That’s why The BeatTips Manual means so much to me. It came from a good place, you know. It came from me thinking deeply about what I would want my son to know about music and beatmaking, and how I could best teach him and help him to learn how to teach himself. That’s the essence, the soul of The BeatTips Manual. As far as how I approached writing/creating The BeatTips Manual, well, I knew from the start that it would take me about 7 to 10 years to get it to where I wanted. A book of this magnitude demands both experience and serious research, both of which take time if you want a real level of understanding. I felt the best way to capture what I wanted to do was to divide the book into five different Parts—a History Part, an Instruction Part, A Music Theory and Culture Part, a Business Part, and an Interviews Part. As far as my focus, I primarily worked on each part one at a time, almost as if each part was its own book. But because all of the parts are interrelated, I never restricted myself from switching to other parts, especially when necessary. So the overall undertaking, that is, to where The BeatTips Manual is right now, that took me about 9 years. The BeatTips Manual means so much to me. It came from a good place...It came from me thinking deeply about what I would want my son to know about music and beatmaking, and how I could best teach him and help him to learn how to teach himself. TNB: Was there a part that you enjoyed writing the most? Sa'id: I enjoyed writing each part and working on each part had its own challenges of course. But the part that I enjoyed writing the most was the History Part. A very close second to that was the Music Theory and Culture Part. Oh, and of course, the Interviews Part was dope! Writing the Instruction Part was like doing surgery, the Business Part was critical, too. TNB: You interviewed legends including DJ Premier, DJ Toomp, Buckwild, 9th Wonder and Marley Marl for The BeatTips Manual. Who did you enjoy interviewing the most? Sa'id: Ha! Listen, although DJ Premier, DJ Toomp, 9th Wonder, and Marley Marl all share a common musical heritage and understanding, they are all distinctly different individuals. Much respect to each of them for the interviews that they granted, by far the most detailed and informative interviews that they’ve ever given on beatmaking and music making in general! I enjoyed interviewing them all, each of them are full of knowledge. Every interview was done in person, one on one, with no time cap. But who did I enjoy interviewing the most? Marley Marl. I mean, he’s the father of modern beatmaking! So much of what we have now in beatmaking is because of Marley Marl. Plus, Marley has a dynamic musical background, he was/is an engineer, a radio DJ/host, a technology guy, and one of the dopest beatmakers (producers) ever. He also loves the history. TNB: One thing I've noticed from your site, www.beattips.com, is your diverse taste in music: from Ahmad Jamal to The Beat (UK) to Gangstarr. How did you develop such a broad taste? Sa'id: Oh, yeah, I’m a huge fan of The Beat (AKA The English Beat). I dig the whole 2 Tone, British Ska scene. Punk. New Wave. Absolutely. Ahmad Jamal, sure thing. Jazz, blues, funk, soul, reggae, ‘80s pop. I dig all of that. I developed a broad taste in music because of my interest in music in general, and as a direct result from diggin’ in the crates. Diggin’ in the crates will certainly help you broaden your taste in music. More importantly, it will help you learn how to make quality hip hop/rap music, trust me. So I want BeatTips.com to reflect my broad interest in music. I also want to show the common characteristics that can be found in all music forms, just as much as I want to show how hip hop/rap music distinguishes itself. TNB: Do you think that with the proliferation of the internet, software and DAW's, the art of beatmaking is being sullied? Is it too easy to make a hip hop beat nowadays? Sa'id: I think the proliferation of the internet and software has made making music much more accessible. I’ve written before how more beatmakers are making beats than ever before. But I don’t blame the internet or software for any sullying of the art form. Software’s just a tool like any other. It always comes down to the individuals making the music. Some people use tools like crutches and lack creativity, but that’s not the fault of the tool, that’s due to the lack of skill, creativity, and imagination of the individual beatmaker. I believe the single biggest thing that sullies the art of beatmaking is lack of knowledge and skills! The less you know, the less skills and understanding that you pack, the more likely you’ll make whack beats whether you’re using software or hardware. TNB: What's your equipment of choice? Sa'id: I use an Akai MPC 4000, an Akai MPC 60 II, and an Akai S950 as my main pieces. The Akai MPC 60 II/Akai S950 combo was my go to for 10 years, then I added the Akai MPC 4000, and later the Roland Fantom S88. I’ve also used Reason before; it’s dope. Pro Tools is my DAW of choice. And I use a Mac. TNB: Who’s your favourite hip hop producer? Sa'id: My favorite producer? Gotta go with DJ Premier. In terms of feeling, Preem’s beats always has that feeling, you know, and the drums, his style and sound. Over 20 years, he’s been consistent. You can’t go a year without at least one new dope DJ Premier beat. After Preem, it’s Marley Marl and then The RZA. TNB: And your favourite hip hop album, production-wise? Sa'id: It’s a tie: I gotta go with Illmatic and Supreme Clientele. 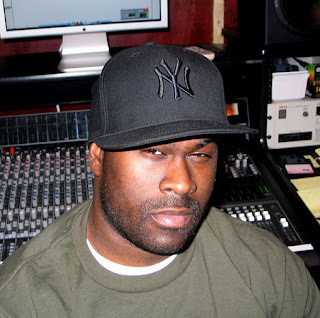 But my favorite beat is the joint True Master did for “Fish” by Ghostface, Rae, and Cappadonna. That “Fish” beat is my favorite beat of all time, and “Fish” is one of my favorite hip hop/rap songs of all time. I want BeatTips.com to reflect my broad interest in music, and I also want to show the common characteristics that can be found in all music forms, just as much as I want to show how hip hop/rap music distinguishes itself. TNB: The New Beat Maker caters to people just starting out. How would The BeatTips Manual help them? Sa'id: Whether you’re just starting out, been making beats for while, or you’re a seasoned veteran, The BeatTips Manual will help you. The BeatTips Manual is designed to help both the experienced and the inexperienced, as it provides guidance that you can trust for all levels. As far as those people who are just starting out, it will help you in regards to everything from understanding the history of beatmaking and hip hop culture, to getting the gear that’s right for you, to understanding music theory, to composition—drum programming, sampling and non-sampling, to the business aspect of beats and music. TNB: What other projects should people check out? For more information and to buy the BeatTips Manual, visit beattips.com.